Chandigarh, the capital of the Indian Punjab, was seen as a ground-breaking experiment in town planning when it was commissioned following Indian Independence in 1947. Designed by Swiss-French architect Le Corbusier, the city’s orderly grid of boulevards combined with extensive stretches of green were felt to represent a new India which was ready to embrace the country’s independent future. 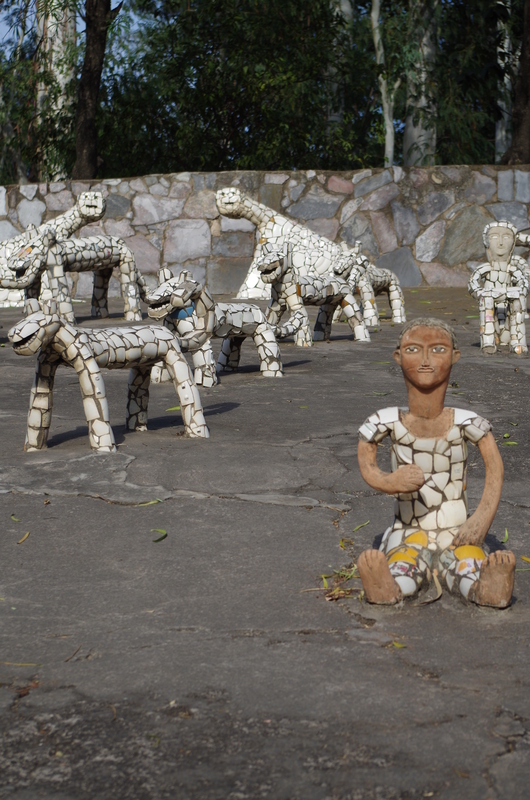 But it was one man’s project of passion secretly constructed on the edges of this rigidly planned city which would eventually become the main reason thousands of visitors would flock to Chandigarh. Having only ever disclosed his work to his wife and a few trusted friends, when the authorities discovered Chand’s work in 1975, instead of demolishing this illegal constru ction they gave Chand permission to continue, naming the site ‘Rock Garden’ and assigning him a work force to continue his construction. 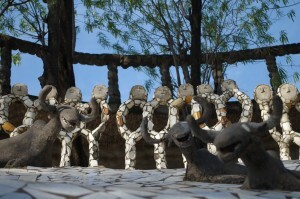 Today, Chand’s Rock Garden is a government-sponsored tourist site and claims to be India’s second most popular tourist attraction after the Taj Mahal. To enter, you need to stoop under a low arch in the opposing perimeter wall from which a number of mosaic cranes observe your every move as you enter Chand’s maze of winding pathways which he constructed using no formal plan, just the natural undulations of the landscape as a guide. Walking this maze of decorative pathways visitors can discover 40ft waterfalls which emerge from concrete forts, elaborate arches decorated with old electrical parts and brightly mosaicked outdoor theatres constructed over rivers. As visitors move through to third phase, they are lead through a manmade gorge, the walls of which have been constructed using sacking and cement which bulge as though about to give way at any moment. 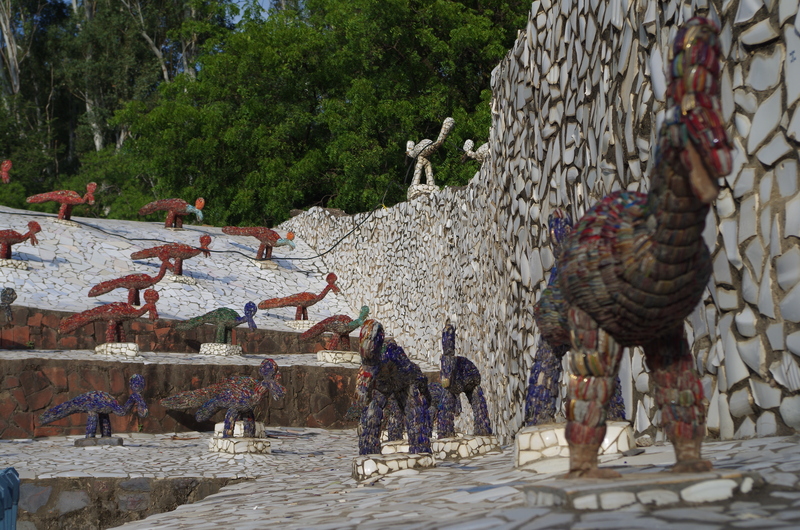 Despite this dramatic entrance, the third phase feels a little disappointing and more like a Nek Chand theme park complete with an aquarium, food stalls and camel rides. More mass production construction than organically grown creation. 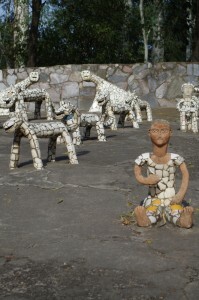 The real delight of the Rock Garden can be found in its second phase where human and animal characters group together to form the garden’s sculpture collection. 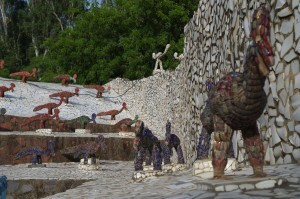 Having created a walkway with carefully mosaicked raised platforms on either side, you feel you are wandering through a series of stage sets on which a varied cast of creatures and people rehearse for their next performance. As you saunter past broken bangle peacocks, men with teacup hands and bears with clinker fur, the mind boggles to devise what the story is these unique and wonderful characters are trying to communicate. Jackson’s passionate study culminated in an exhibition of his research and Chand’s sculptures at Liverpool’s RIBA Gallery back in 2007. Making a concerted effort to evoke a sense of physically being in the Rock Garden through the exhibition experience, Jackson found the individuality of Chand’s work translated well to a UK audience. 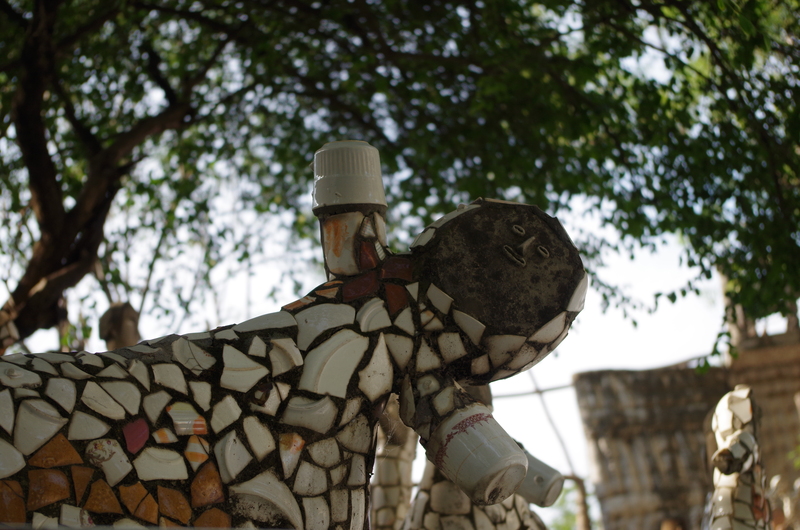 Nek Chand’s Rock Garden is a unique world of possibilities which has brought pleasure to the hundreds of thousands of visitors who have wandered its pathways discovering hidden spaces and delightful characters. A true project of passion, the feeling that one man poured every extra scrap of his energy into making this space a reality can be found in each part of the garden’s detail. 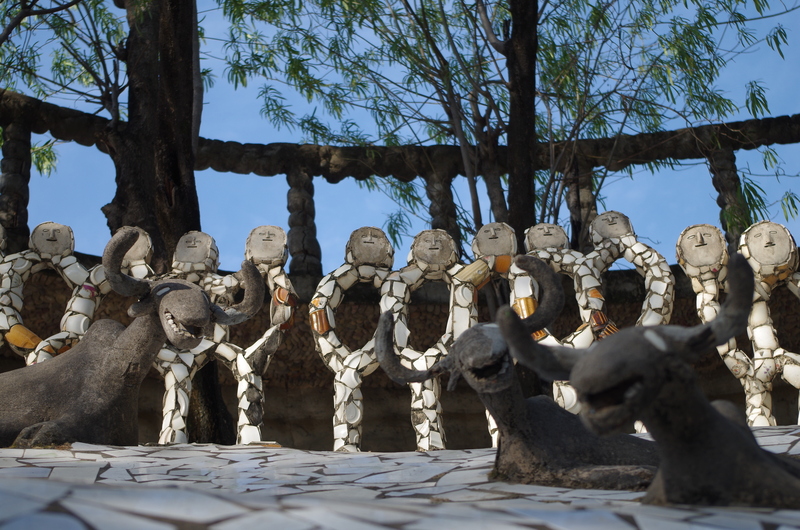 Now an internationally recognised and respected artistic endeavour by one of India’s greatest living artists, the Rock Garden will no doubt attract and enchant visitors for years to come. 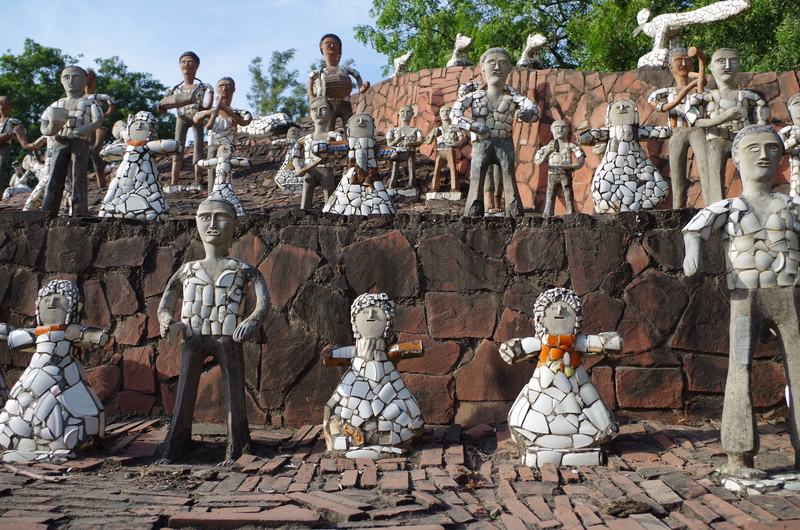 *Quote – sourced from A Visit with the Master: The Creative Genius of Nek Chand in the essay Nek Chand Shows the Way by Philip Reeve, originally published in Raw Vision #9. In 2014 the gallery underwent a radical £15m transformation, doubling in size – and while it was closed, ran a series of experimental pop-up events. The Whitworth Institute and Park opened its doors in 1889 with support from 60 eminent Mancunians, including CP Scott, the editor of the Manchester Guardian. Part of the University of Manchester, it was founded in memory of the industrialist Sir Joseph Whitworth, for ‘the perpetual gratification of the people of Manchester’. Much has changed about the gallery in the past 126 years – including its name – but that objective has remained constant. During 2014 the Whitworth underwent the largest physical transformation in its history. The £15m redevelopment project by McInnes Usher McKnight Architects doubled its size and created several new, dynamic spaces. While the gallery was closed throughout the year, its programme of events was very much open, with projects happening all over the city and beyond – including a pop-up gallery at Selfridges Manchester and art activities at pubs, residential care homes and a local branch of ASDA. Through this lively pre-opening programme, the gallery attracted new audiences while preparing for its grand reopening in early 2015. The Whitworth has created new opportunities for people of all ages and backgrounds to engage with art of the highest quality. The new building allows the gallery to undertake larger and more ambitious projects, realising its full potential as a major UK cultural destination. It was announced at 9pm on Saturday 16th May that the Williamson Art Gallery and Wirral Museums gained the public vote during a contest with 4 other national venues to win the opportunity to host a major exhibition in October working with internationally known artists, Davy and Kristin McGuire. The Williamson Art Gallery and Museum, Birkenhead winning bid was to invite the McGuires to use two marble statues, ‘Pauline’ and ‘Love’ to create a series of grottoes. Using projections, lighting, textures, sound and print, the gallery will be transformed into an enchanted garden animating a narrative imagined and developed with staff and visitors. As well as the exhibition, the Williamson team and Friends of the Williamson will create a special ticketed gala evening around the theme of the McGuire’s artwork and hope it will be as successful as the BAFTA gala held earlier this year. 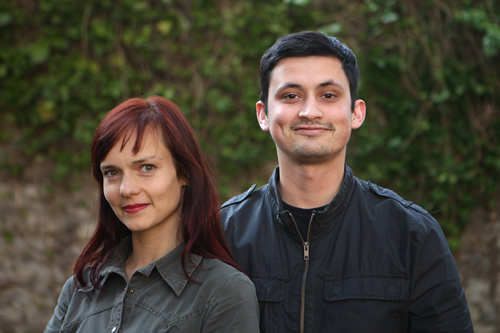 The competition was part of the Museums at Night festival in Friday 30 – Saturday 31 October 2015, the recent Light Night in Liverpool is the spring offering in the scheme. The bi-annual UK-wide festival attracts visitors into museums, galleries and heritage sites by throwing their doors open after hours and putting on special evening events. Co-ordinated by non-profit cultural publishing organisation Culture24, Museums at Night is an opportunity for the cultural and heritage sector to come together around a single, simple campaign that is attractive to venues, audiences and the media. 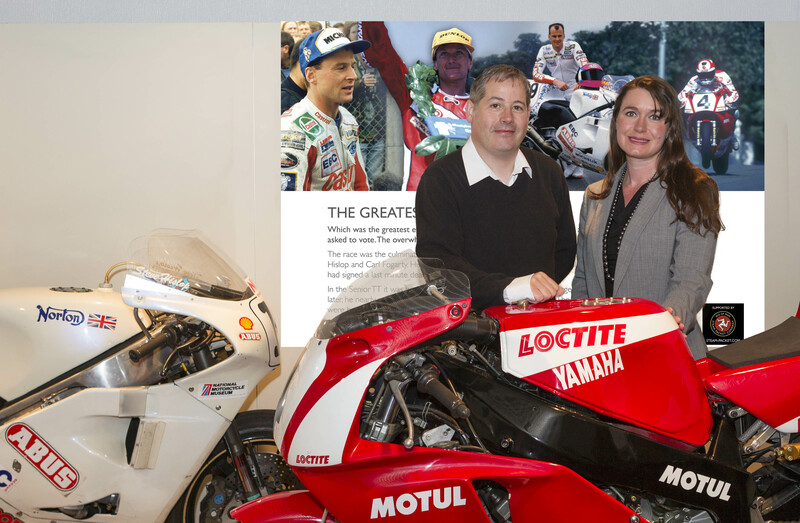 Manx National Heritage and the National Motorcycle Museum in Birmingham have reunited the two bikes that participated in what is widely recognised as the greatest TT race of all time. Carl Fogarty’s Loctite Yamaha 0W01, owned by Manx National Heritage and the National Motorcycle Museum’s ex works Norton NRS588 that Steve Hislop raced memorably over six enthralling laps in the 1992 Senior TT will feature in a unique display, supported by the Isle of Man Steam Packet Company, at the Manx Museum in Douglas for the duration of the TT festival. The race, which was voted the Greatest TT Race of all time in a poll by Isle of Man Post Office, saw Hislop swap the lead with Fogarty throughout the race before the Scot eventually won by just 4.4 seconds. Fogarty had the consolation of setting the outright lap record at 122.61mph while Hislop set a race record of 121.8mph. The display forms part of a programme of Manx National Heritage events and exhibitions for visitors and local residents during this year’s TT. Other activities include talks and a film by Mike Hailwood’s son Dave, a short film screening of ‘No Ordinary Passnger’ and Q&A session with 90 year old ex sidecar world champion Stan Dibben and an exhibition featuring Ulster’s TT Heroes at the House of Manannan in Peel. Manx National Heritage has also produced a TT collector’s pin badge, which retails at £10, which gives users free admission to all Manx National Heritage sites throughout both the TT Races and Isle of Man Festival of Motorcycling.